'Loving Vincent' Paints Van Gogh Into A Murder Mystery Loving Vincent is a murder mystery animated a unique way — with 65,000 oil paintings in the` style of Vincent Van Gogh. It begins in 1891, a year after Van Gogh died, when a postman discovers an undelivered letter the artist wrote to his brother Theo, and sends his very reluctant, very drunk son to deliver it — a task that will prove difficult. The postman's son discovers that Theo died soon after Vincent did, and then tries to find others who knew him, realizing as he goes that the death that was said to be a suicide, may not have been so cut and dried. All of this is about what you'd expect of a film — in this case an animated film — that means to make a mystery of Van Gogh's suicide. But if you're picturing "animation" in the Disney-drawn or Pixar-computerized senses of the word, you'll need to think again. 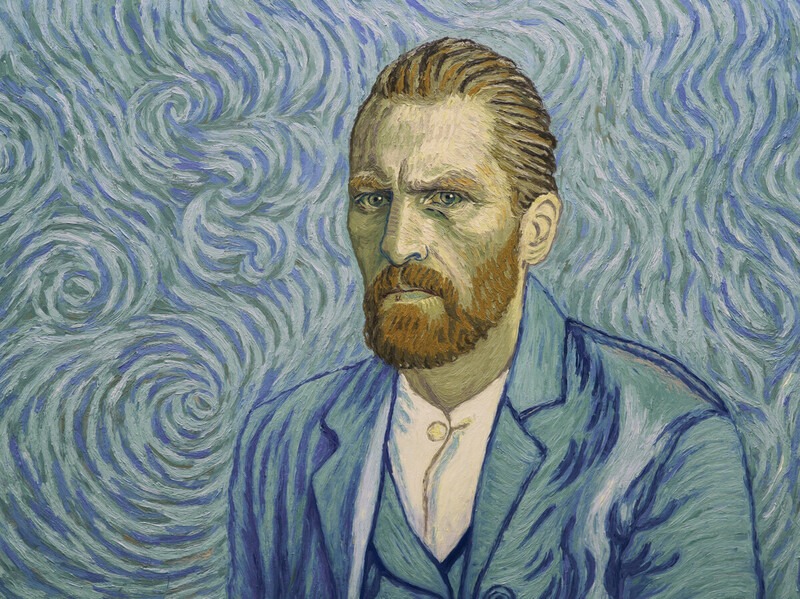 In Loving Vincent, it's as if the paint has leapt directly from Van Gogh's canvases to the screen, and then started moving. The credits begin with what look like broad brushstrokes being painted on glass — thick oil paint — blue-green swirls and yellow smears that gradually resolve into a familiar image: the moon glowing in the middle of one of Van Gogh's most famous canvases, The Starry Night. There are those circular, roiling clouds, the slender cyprus tree on the left, and the church spire just to the right of the tree. As the camera zooms in, that spire turns out to be part of a town, where we hear a fight break out. From The Starry Night to fight-night in twenty seconds, a striking introduction to a film that is about to provide a tour through many of Van Gogh's most famous works: rooms in taverns, crows flying over wheat fields, portraits come to life and talking a mile a minute. Directors Kobiela and Welchman first shot their story as a live-action film with actors in costume, on sets that look like specific Van Gogh paintings. You'll likely recognize many of the paintings, though they're often modified and elongated to fit the shape of the movie screen. Then the filmmakers employed more than 100 artists to hand-paint each frame's image in oils, matching Van Gogh's style and brush-strokes. Once a frame was painted, it was photographed, and then the artist could create the next frame by painting over the parts that needed to move. The effect is remarkable, hand-painted animation turning out to be very different from hand-drawn (where lines merge smoothly as figures move). Here, water clots and gushes, a quizzical expression flickers into anger around the eyes, and when a mysterious figure zips through a garden, he leaves a physical imprint — thick oil impasto — on the painted grass. Altogether, some 65,000 oil paintings were created for Loving Vincent, which speaks to the passion the filmmakers had for their subject. Their story isn't quite as compelling as their execution, but during the final credits, when images of the performers are juxtaposed with Van Gogh's original portraits, and also with the screen versions they inspired, you will marvel at the art in this labor-intensive labor-of-love.